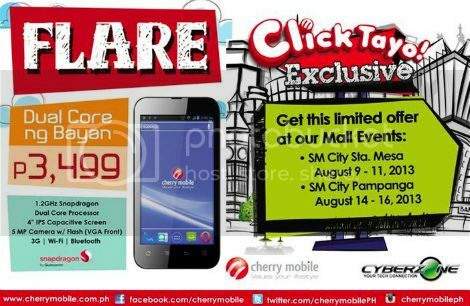 Cherry Mobile Flare now goes down to Php3,499, with their “Click Tayo! Exclusive” at SM City Sta Mesa from August 9 – 11, and SM City Pampanga from August 14 – 16, 2013. Cherry Mobile Flare sports a Snapdragon dual-core processor clocked at 1.2GHz, with a 512MB RAM, running on Andoird ICS. Though, Jelly Bean updates are available at their service centers. CM Flare also has a 4-inch touchscreen display, with a 5MP rear camera and a VGA front-facing camera. It has dual SIM capability with a 3G module on the first SIM, plus it has Bluetooth, Wi-Fi and hotspot as well.